Do you use Google+ hangouts for your marketing? Are you wondering how hangouts can help your business? 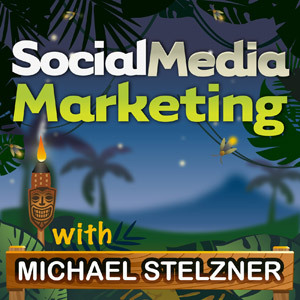 To learn how to get started with Google+ hangouts, I interview Brandee Sweesy for this episode of the Social Media Marketing podcast. 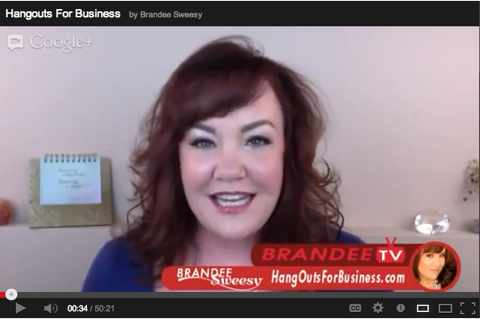 Brandee shares how you can use hangouts to promote your content. You’ll learn the different techniques to help brand your hangouts and the best ways to promote attendance. Brandee states that first of all, it’s free. Google describes it as a unification of their video, chats and messenger service all in one place. It was a replacement for Google talk and Google chat. Hangouts can either be private or you can stream live to your YouTube channel with Hangouts on Air. Brandee explains that if you’re a consultant or coach, you can use hangouts like you would Skype. The quality of the video is amazing. If you want to record your private hangout sessions, then you will have to use Camtasia or ScreenFlow. These hangouts are great to use for team meetings, consulting, coaching or when you privately advise people. With a hangout on air, you can host yourself and up to nine other people. You can all be on the video at the same time, where you can chat and give a presentation. This can be done with private hangouts and hangouts on air. You’ll discover why you need to keep control of the sound-activated screen and what you need to do. You can control who is in the larger screen. Hangouts on air stream live to your YouTube channel. It’s linked to your Google+ page. 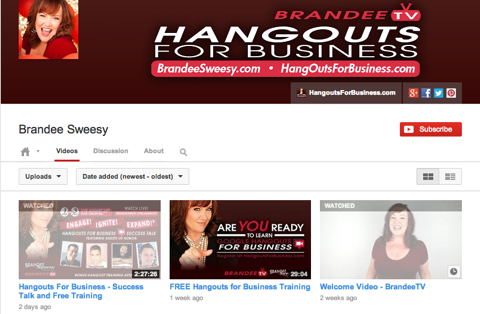 If you have a Google+ profile or a Google+ business page, you link it to your YouTube channel. You need to have your YouTube channel verified for uploads of more than 15 minutes and most hangouts run longer than that. The great advantage when you stream live to your YouTube channel is that at the end of the broadcast, you have unlimited YouTube content. You’ll find out what you need to add once you have finished the live stream to be able to optimize your video marketing. When you stream live, it also runs on your Google+ profile page at the same time. Once you start a hangout on air, you can take the embed codes and share them on a Facebook tab, website or blog post. You can then direct people to watch it there. Share the embed code on Facebook to announce that you are live on air. There’s also a Hangouts on Air page that lists all of the hangouts that are currently on air. Listen to the show to learn about how you should name your hangouts to grab people’s attention. How does a hangout differ from a webinar? Brandee first saw hangouts as a possible replacement for webinars. A lot of the webinar platforms are expensive and if you only do a few, it can be hard to justify the cost. Many webinar platforms base their price on the number of viewers. But with a hangout on air, you have unlimited viewership. Brandee explains how she has done webinars by herself with a slide presentation embedded on a website that has unlimited viewers. With hangouts on air, you don’t need to buy expensive plugins for your website. People can enter their email address and then flip over to a Watch Live page. You can have people opt in on your website and then flip through to your Watch Live page. You’ll discover the best option to help build engagement and keep viewers from getting distracted. The advantage with hangouts is you have the opportunity to share an image with your audience, plus have that face-to-face connection, all in one place. You can share content with both private hangouts and hangouts on air. All you have to do is press the Screen Share button. Brandee’s trick is to never share your desktop screen. Always make sure you close everything down first, except for what you want to share. If you use Keynote, you need to convert your slides into PowerPoint, then load them into your Google Drive and select Present in New Window. You’ll also learn how you can build your slides in Google Drive and Brandee’s secret trick. Listen to the show to find out how to control the main video and swap among guests. Brandee says the number-one reason is because it’s YouTube. Videos always rank higher in searches and hangouts on air jump very quickly to the first page of Google. With normal video, you have to go through and edit it before it is released; whereas with hangouts on air, you have the live streaming to YouTube. This gives you unlimited YouTube content. If you are strategic with the optimization afterwards, you will skyrocket to the first page on your subject. Remember that people buy from people they know, like and trust. It’s a huge opportunity to allow people to get to know you face to face. You’ll hear what people can gain from these live experiences. Brandee has had clients who have made $12,000 with one hangout on air alone. You can also create web shows, which help build your list and engagement with your audience. People love it when you mention them live on air. When you have a weekly show at a certain time and are consistent with the people you interview, it’s a great benefit to your business. 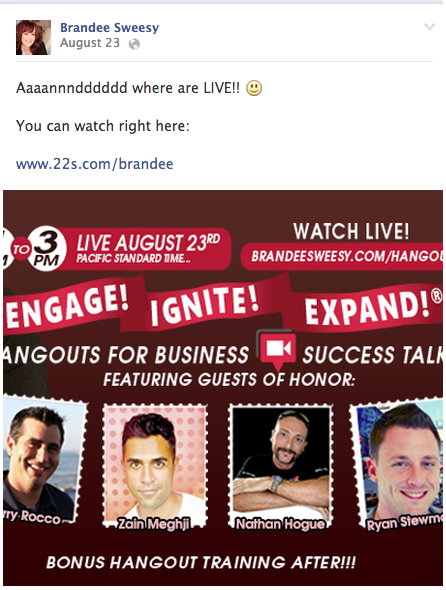 You’ll discover how the analytics work for live streaming and what made Brandee’s viewers double in 24 hours. If you want to share exclusive content, the best option is to go back into the video once the broadcast has ended and mark it as unlisted. This allows you to share your exclusive content with only the people who registered to watch it. Once you mark it as unlisted, it’s pulled out of your YouTube channel. You’ll also learn another way to share exclusive content. Brandee shares what equipment she uses for her videos and why there is zero labor involved. Listen to the show to find out about what you need to learn first before you start to record and what Brandee tests before she starts a broadcast. What kind of apps can enhance hangouts? One of Brandee’s favorite apps is the Hangout Toolbox. It allows you to have a lower third, where you can put your name and your website address. You can brand your video in the lower third with your name and website address. Even if it’s a hangout with others, you still need to have your name, website address and a call to action there. You can also use your logo in the same area. The Hangouts Toolbox has custom overlays, so you can make sure you have a well-branded lower third. It’s great for consistency and branding. It helps with when you are on other shows too. Listen to the show to find out what size the lower third needs to be. Brandee states that you first need to know the answer to “What is your why?” Once you understand this, the next stage is your strategy, which includes where you want people to watch your hangouts. If you’re a video person, you’ll want to send viewers to your YouTube channel. For a marketing person who wants to build a list, then the best place to send them to is your website and ask for an opt-in. It all depends on where your biggest audience is. As with all marketing, it’s about consistency. If your goal is to build relationships and engage your audience, then you might want to do a weekly show. If you want to sell a product, it won’t be as often but you will become known for this through your hangouts. It’s another marketing tool. You’ll hear about two guys who co-host Social Media Maniacs and how within a couple of weeks they went from zero subscribers to thousands. Although hangouts can be any length, the ideal time is around 30-45 minutes. It only works for longer periods if it’s high-energy and moves forward. 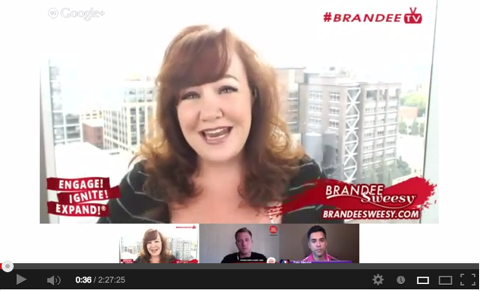 Brandee talks about viewer engagement and what you need to take into account when you ask questions. Get viewer engagement with an attention-grabbing promotion. People love it when you include them in a hangout. Make sure you prompt for questions. The Hangout Toolbox and Comment Tracker will let you pull comments in from your YouTube channel, your Google+ profile and your Twitter account. You can then pop these on the screen. Listen to the show to find out the best way to include comments if the hangout is on your blog. First you need to decide what your goal is and where you want to send people. It’s the number-one consistency in your marketing. Brandee firmly believes that you should go where your audience is. Never try to drag them to another place. You need to make it as easy as possible for your end users. You’ll discover what promotional pieces work best and what you need to include to help drive people to one location. If people happen upon you on the Hangout on Air page or on your YouTube channel, then these are bonus people. When you promote your live event, you need to start 4 days in advance. Brandee uses a plugin for her website, so when you land, you need to fill in your email. Then instead of a double opt-in, it takes you through to the Watch Live page. 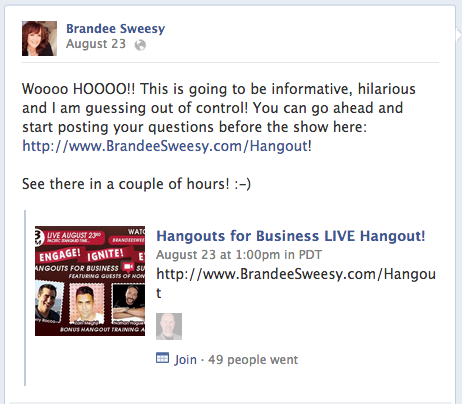 Brandee shares how she gathers questions for the show and what techniques she uses to remind people of the live hangout. You need to keep promoting right up until the last minute before you go live. About 30 minutes before you start your hangout on air, Brandee advises to start setting up and making sure the lighting and camera angle are in a good position. You only start to stream live once you click Start Broadcast. 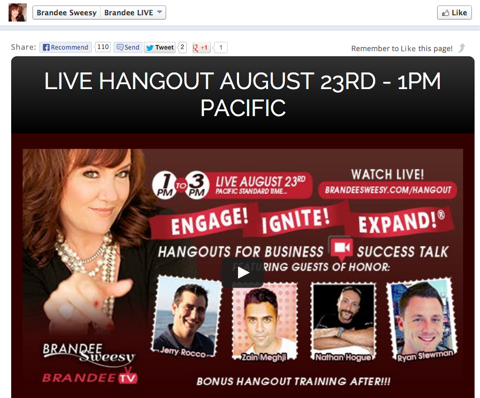 You’ll hear how Brandee does one last promotion 5 minutes before the hangout starts. Once the broadcast has finished, the video is available within a couple of minutes in your YouTube Video Manager. You now have the opportunity to add the description, keywords or even edit the video. Brandee shares how to make a trailer for your longer broadcasts and where to add annotations. Listen to the show to hear what Brandee trims off her video. If you find yourself staring at your screen too long, then a cool tool to check out is f.lux. You can install it on your computer and iPhone/iPad. It coordinates the time of day with the brightness of your screen. As you approach the nighttime, it takes the blue out of the screen and replaces it with red. It’s a great option, as it doesn’t make the screen so bright if you want to check something when it’s dark out. Your screen adapts to the time of day. We have recently founded a brand-new LinkedIn group called the Social Media Marketing Networking Club. It’s a place where you can go to help other people, network with your peers and get your questions answered. You can also post job openings. The Social Media Marketing Networking Club is a great place to connect with other marketers. What makes it different from other LinkedIn groups is that it’s fully moderated by three people. You won’t see a lot of spam in there. It’s a very small group. There are just over 2000 members in it right now. These are marketers who really want to help others and enjoy networking. Go and check out our new LinkedIn group. The conference is spread over the month of October and is designed in 45-minute sessions, so you get intense, high-quality content. We cover every social network and also include video marketing, podcasting and blogging. It’s a great opportunity if you are thinking of getting into blogging or you want to master social media. It’s completely live online and you get the recordings and the transcripts. Be sure to check it out. Connect with Brandee Sweesy on her website. Register for Hangouts for Business for products and free giveaways. Read this Hangouts on Air guide. Use Camtasia or ScreenFlow for screen recording. Check out Keynote and PowerPoint for presentation apps. Try the Hangout Toolbox for creating your lower third. Head over to Fiverr if you need a designer. 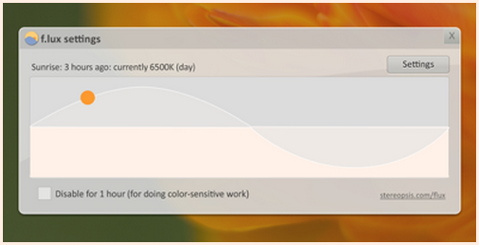 Discover more about f.lux, which makes your computer screen adapt to the time of day. Check out our new LinkedIn group, Social Media Marketing Networking Club. What do you think? What are your thoughts on Google+ hangouts for your business? Please leave your comments below.